They’re huge. They want your food. They’ll even be happy to live in part of your house, seriously damaging it in the process. 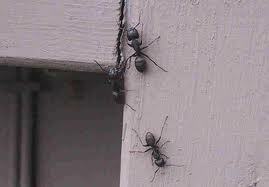 They’re carpenter ants, but fortunately, they’re not a sure thing. An ounce of prevention is worth more than a pound of cure in this case, and preventing an infestation may be easier than you think. One of the best ways to avoid a carpenter infestation is to make certain you don’t let any moisture issues go in or near your home. Carpenter ants love moist wood, and in a natural setting, they’d live in rotting trees, tree roots, or even tree stumps. In the event they’re looking to invade your home, though, if you’ve ever had a leak behind a bathroom tile, near your tub, sink, shower, or even your dishwasher, you’re creating a haven for carpenter ants, especially if you haven’t bothered to replace the wood that got wet. You can also keep the problem at bay by taking a quick look around the outside of your home. If you have mulch too close to the house or you keep your firewood near the house, you could be creating an engraved invitation to these pests. Keeping your kitchen, and your home as a whole, clean is essential as well. Carpenter ants love many of the same foods people do, including sweets and various meats, so leaving food out, or even accessible in your kitchen may create an infestation. Make certain you seal foods in containers, even when you store them in your cupboards. Even if you do discover that you have a carpenter ant infestation in your home, it’s still very possible to get rid of it. The key, however, is to call in the professionals. A spray can off the shelf of the hardware store simply won’t cut it in this case. A professional pest control company can not only help you locate the nest, but also find spots in your home that may have attracted the ants in the first place. Don’t deal with carpenter ants this year. Avoid the problem with a bit of prevention.